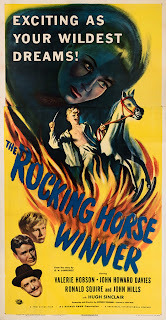 Based on a short story by D.H. Lawrence, The Rocking Horse Winner is a black-and-white movie straddling the line between drama, horror, and fantasy. I found it on a few lists of Christmas movies, though I'm not 100% certain I agree with its inclusion. 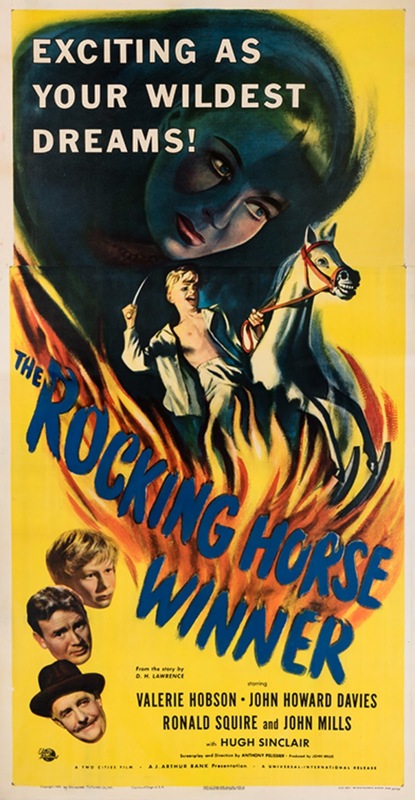 The movie either qualifies or fails to qualify solely based on its first twenty minutes, in which one of the lead characters, Paul, receives a rocking horse for Christmas. Granted, that's not entirely dissimilar to our justification for including Sleepless in Seattle. And there's something to be said for a movie that revolves around a haunted Christmas toy. The tag attributes the gift to Father Christmas, though the movie never directly addresses where it comes from. Presumably, it was purchased by one or both of his parents or his uncle, though it's not an entirely unreasonable interpretation to take the tag at face value. That said, the rocking horse seems to be evil, so that's not the most generous reading towards the Jolly Old Elf. Honestly, it's not necessarily the case that the wooden horse is evil or magical - it's entirely possible everything that happens is the result of powers inherent to Paul himself. I'm not sure whether this is the result of ambiguity or just details left unexplored. Thematically, it's irrelevant, anyway. The story mostly concerns Paul and his mother, Hester, an irresponsible housewife who spends recklessly. If that makes you cringe, take some solace in the fact the movie is a bit more charitable towards her than it could have been. It still makes her somewhat culpable in her son's death, but it's at least sympathetic. Oh, right. Spoilers or something. The "magic" at the core of the premise is that Paul's able to predict the winners of horse races by riding the rocking horse, but doing so exhausts and (in the end) kills him. He also hears his house whispering that it needs more money. If you're waiting for me to get to the plot, get ready for a twist: I just covered it. Okay, to be fair there's a little more, but it concerns Paul teaming up with the groundskeeper and eventually his uncle to place bets and sneak the cash to his mother without her realizing where it's coming from. Then she spends the money, so Paul pushes himself further to get more. You already know how that goes. Oh, Paul also has a father who's bad with money and loses money gambling. But this never ties into Paul's power, and the father basically stops showing up about halfway through. He's still ostensibly in Paul's life, but a large section of the movie just forgets to include him. There are a handful of good aspects to this movie, starting with the horse. It's designed and shot in a way that makes it suitably creepy to sell the idea something dark is occurring beneath the surface. Likewise, the shots of Paul riding and entering a trance are unsettling. But I don't think that makes up for the movie's faults, starting with the fact there isn't enough substance to the story to fill out the hour and a half run time. The same premise would have been a good candidate for a thirty minute episode of The Twilight Zone. As a feature-length film, it drags. A strong enough ending could have forgiven this, but the conclusion is one of the weakest parts. The main issue is there's nothing really tying the tragedy to the moral. At its core, this is a simple cautionary tale about valuing money over love. So... wouldn't it have been a good idea to actually have a character make that error? Paul's parents are bad with money, and they're presented as selfish in prioritizing their desires over the wellbeing of their household. But they're never placed in a situation where they confront this head-on. Paul's mother's materialism has consequences that drive Paul towards getting himself killed, but she's never aware of any connection until it's too late. Really, it's whatever dark magic infuses the house that's to blame. It would have been easy to fix this. They just needed a scene where one or both parent learns about Paul's ability and pushes him to use it one final time to settle their debts. Have them gamble with his health and lose - there's your damned cautionary tale. Overall, I don't think this quite delivers an experience or story that justifies sitting through it. There are better Christmas tragedies and horror stories.